What you see above are five-clusters of the farthest-away galaxies Astronomers have ever seen. The galaxies are 13.1 billion light-years away and are at the very beginning stages of galaxy forming. The five tiny clusters are being called the Protocluster of Galaxies BoRG 58 (no, not that collective). 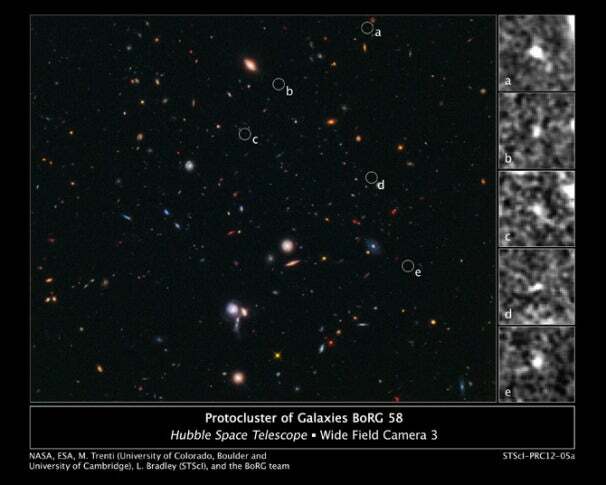 They were discovered with the Hubble Space Telescope’s Wide Field Camera 3 as part of a collaborative effort between scientists from NASA and the European Space Agency (ESA), alongside Michele Trenti of the University of Colorado at Boulder and the Institute of Astronomy at the University of Cambridge; Larry Bradley of the Space Telescope Science Institute, Baltimore; and the BoRG (Brightest of Reionizing Galaxies) team. Because the galaxies are so far away--a light-year is a measure of distance that light (the fastest moving energy in the universe, so far as we can tell) can travel in a single year--we are essentially looking into the galaxies’ past when they were just forming. The galaxies aren’t just young, they could quite possibly be one of the first galaxy babies to cluster and form together 600 million years after the Big Bang. The results of the astronomers’ studies will be published in an upcoming issue of The Astrophysical Journal. The scientists also plan to further study BoRG 58 with spectroscopic observations to measure the expansion of the universe. If I’ve got my math right, that’s… 77,009,992,388,705,264,808,608.700999238870526-to-the-power-of-22 miles away? Leave a Comment.